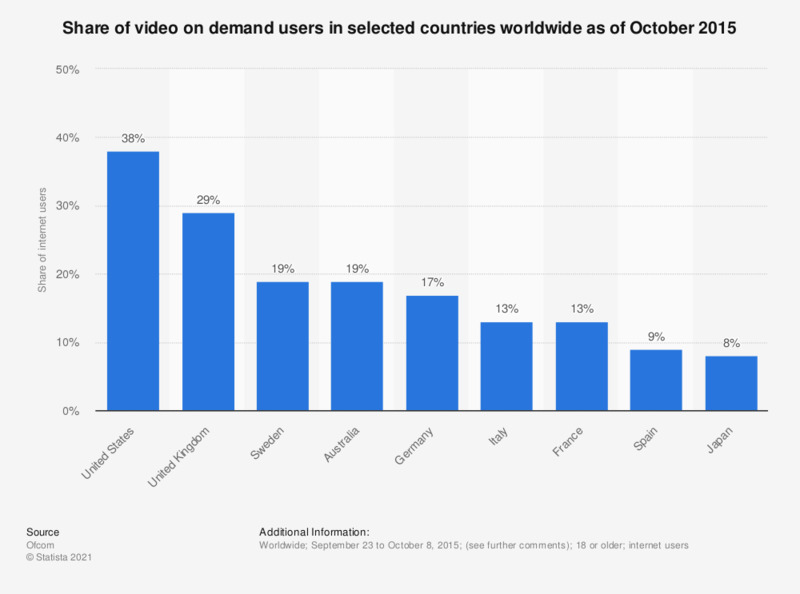 The statistic shows the take-up of video on demand on the TV in selected countries as of October 2015. In the United States, 38 percent of respondents stated they used video-on-demand services. By contrast, only nine percent of respondents in Spain stated that they use similar services. Demand for a more personalized experience for users and the increased usage of smartphones, tablets, and other devices are raising expectations for the video on demand industry. Video on demand markets are merging in order to obtain higher market visibility. A wide range of services such as internet, broadcasting, and television programs are available for industry users. Prominence in education, research, conference, and of course, entertainment industries allow the video on demand market to reach a broad audience. In the United States, free on demand videos dominated with 62.6 percent of time spent on these types of videos in 2016. The share of consumers in the United States who have a subscription to an on-demand video service has increased from 51 percent in 2016 to 58 percent in 2017.